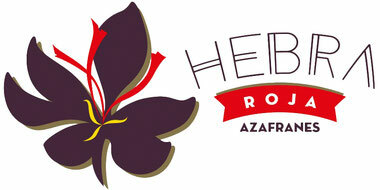 The first steps we undertake to obtain a high quality product is the choice of our plots. They are provided with sprinkler system and fertile ground, which results on clean and free of sanitary problems fields that could hinder the growth of our plant floors. In addition our corms, once taken out of the earth are cleaned and classified by size to select those with a higher performance, always from an artisanal point of view, which is our main objective. One of our favourite montes is the beginning of Flowering period. Harvesting usually starts mid-October and lasts until 8th /10th November, although these dates may vary slightly because of the weather conditions, which as in many other agricultural products, is a very influential factor. The Saffron plant usually has days of heavy bloom, terminologically call "Días de Manto" that lasts three to seven days. 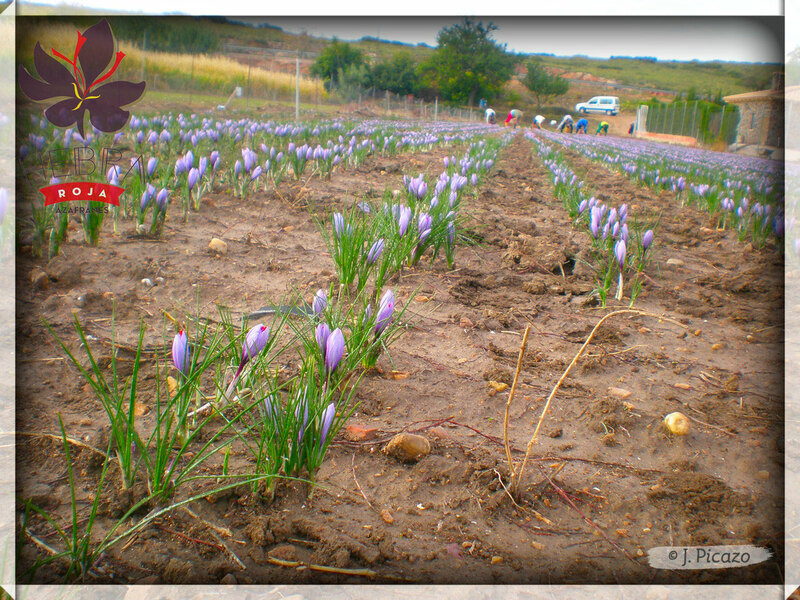 Then, this period start to decrease to make way to what we call "Días de Roseo" and then gradually arrive to this beautiful flowering stage. To make the collection pleasant and enjoy these days of intense work as much as possible, the ambiance is full of jokes, typical songs from our castellanomanchega land, and of course good meals elaborated with typical products of the area to provide the energy needed for those days of hard work. 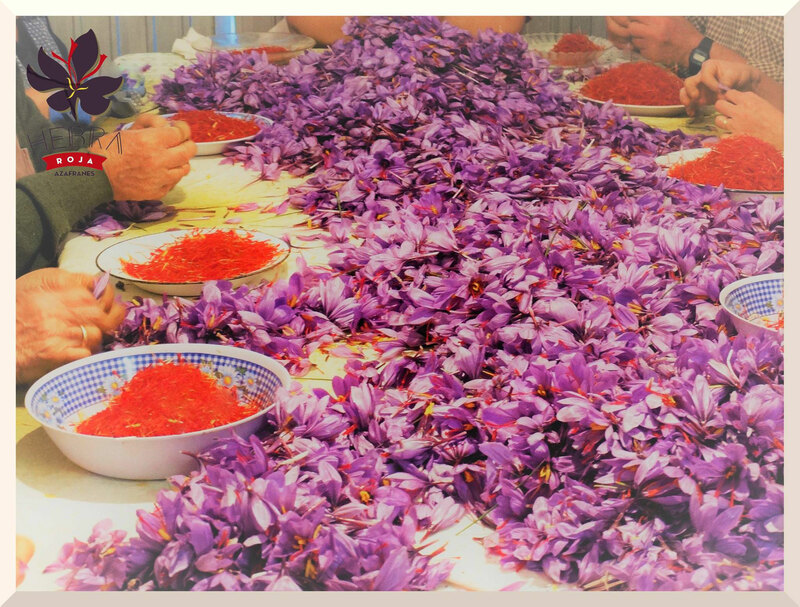 As you can see on the attached pictures, collection is manually done and involves a lot of work and effort due to the body position adopted during the harvest. It also requires a very great skill in order to protect the flower from any eventual damage and help the next process, “pruning the flower”. Collection need to be done with the first rays of light, there are days when we are already in the fields even before dawn. If collection is not done in the early morning, then it becomes very complicated and the flower will start to lose its properties because of light, air, sun ... If this happens the flower opens, fades and delays its collection plus adversely affects the later process of peeling. Once we have collected the flowers, we quickly transport them to the area where they will be peeled. 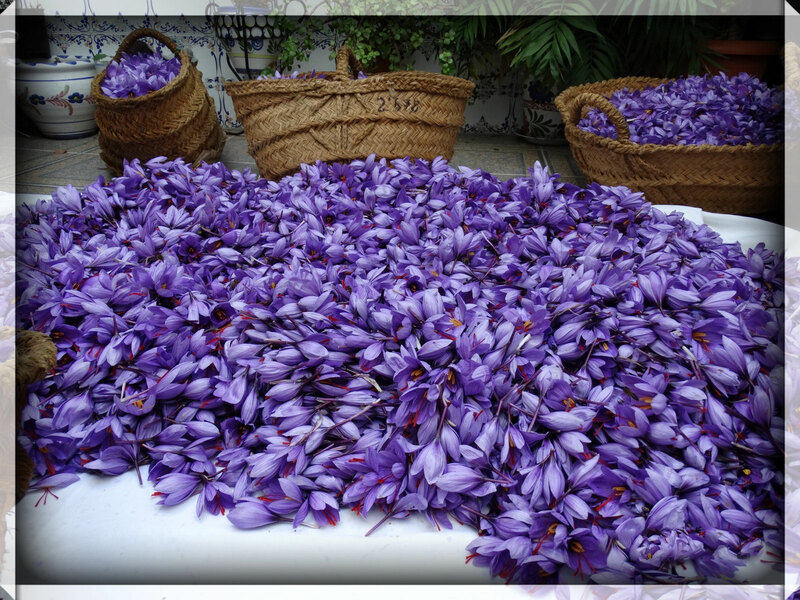 We always use traditional Esparto baskets that are suitable for conservation and where flowers are not crushed together. 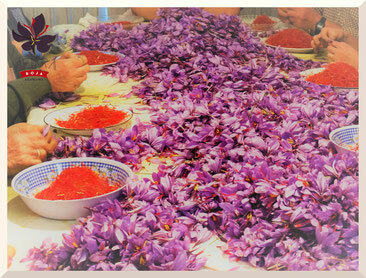 Flowers are also often emptied on large surfaces to help drying and peeling. 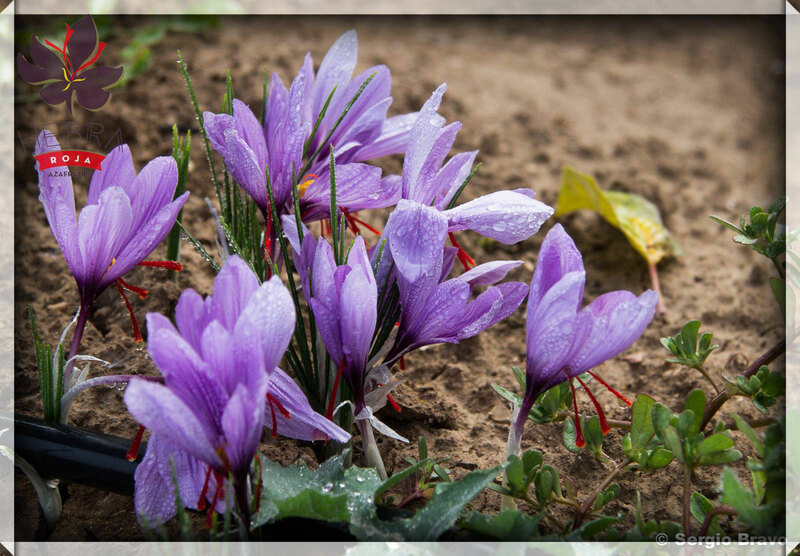 Here flowers start a delicate process that leads to its transformation on the spice saffron. The processes that we describe below are performed on the same day of collection to avoid losing properties. 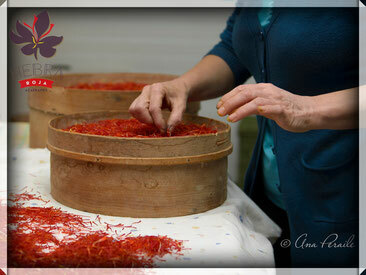 This phase of the process requires a lot of skill in the hands of "peelers". It consists on holding the flower with one hand, cutting the "stem" with the other and gently remove the stigma with its three strands together free of "straws”. 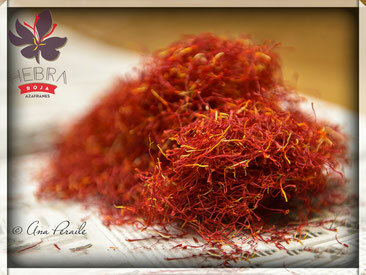 The extraction of the full stigma is the peculiarity that differentiates La Mancha saffron from the others. This is why in "Hebra Roja" Azafranes we only employ the most competent people and take such good care of the whole process. Accuracy and secrecy are appropriate words to describe the following process called "El Tostado". 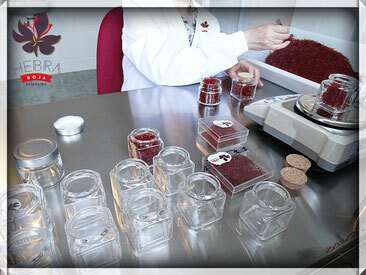 It consists in drying the stigmas we had removed during the above process. 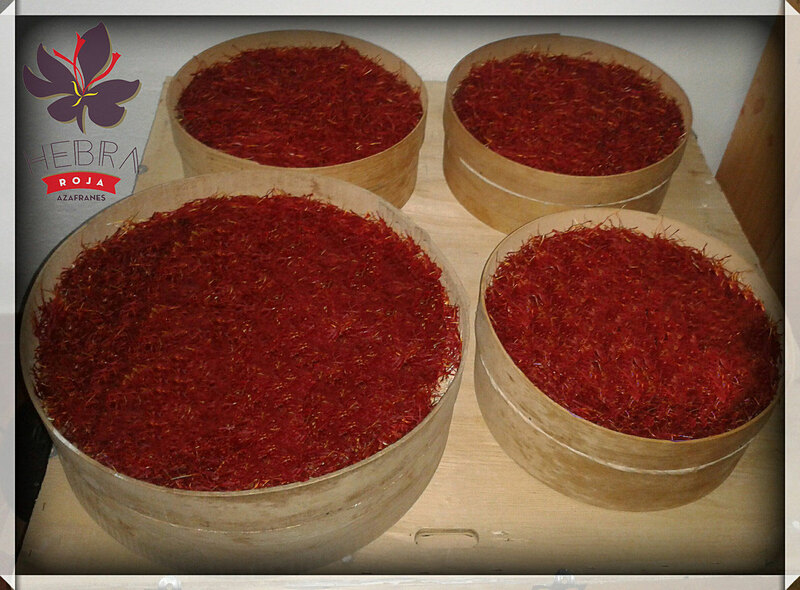 Dehydrating the stigmas reduce their weight up to 20% and makes the stigma become the spice. 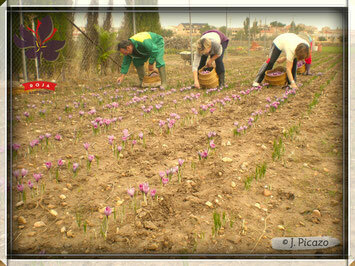 To achieve this transformation stigmas are placed in thin layers on the "cedazos", typical metal and thin fabric. The drying system is by hot air. The heat will be soft to dry properly and avoid burning. 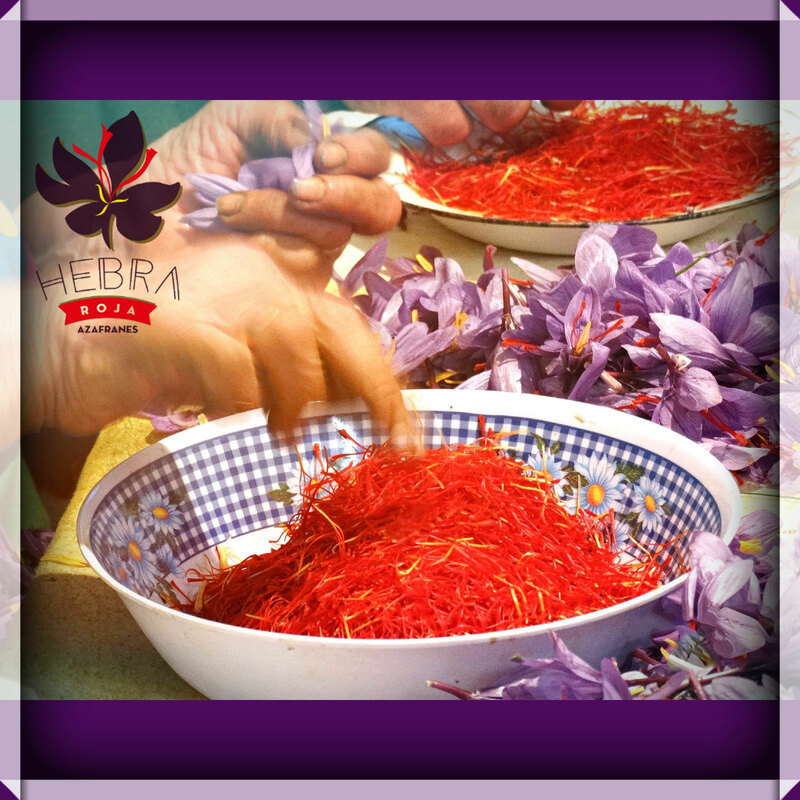 Now we start to appreciate the typical and pleasant smell of toasted saffron, and all our facilities are filled with the aroma, even in the streets near the village you can appreciate this characteristic smell of saffron from La Mancha. As seen in the illustration, saffron reduces its size and adopts a darker colour. Once we have completed the steps of production and processing we start the packaging for further commercialization of our product. 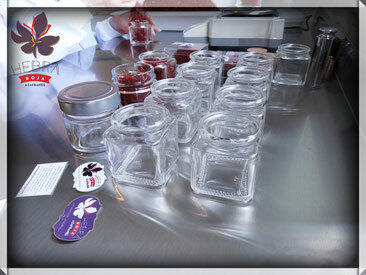 We take extreme care of the whole process to ensure that our product arrives in perfect condition to our customers. 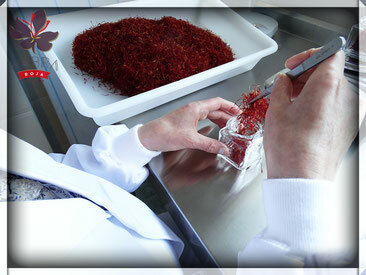 Our product is continuously subjected to strict food safety controls to ensure maximum quality and warranty. 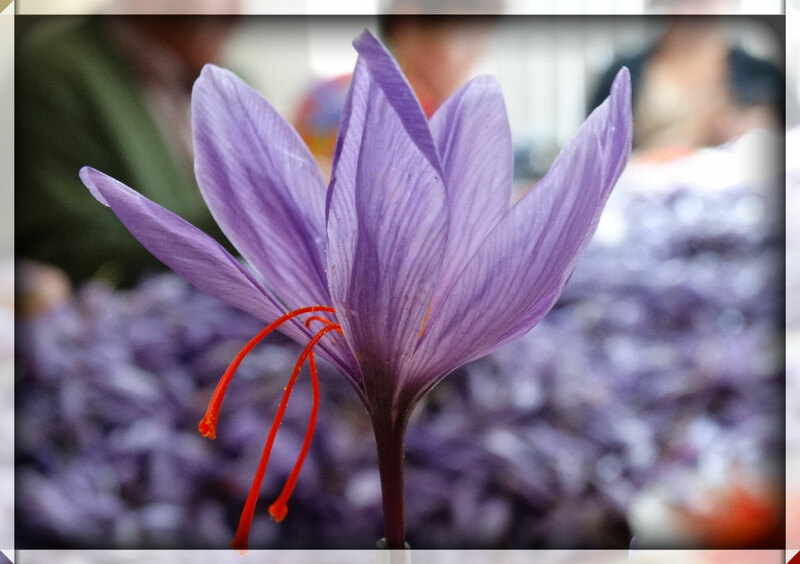 This is why our saffron meets all the requirements of the specification of the Protected Designation of Origin Saffron from La Mancha and all our packages have the warranty seal as a sign of best saffron in the world. 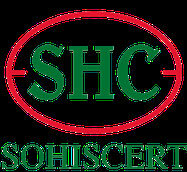 Our main purposes are to meet the needs of our customers and reaching our goals: quality, guarantee and tradition.